We’ve been working on something! 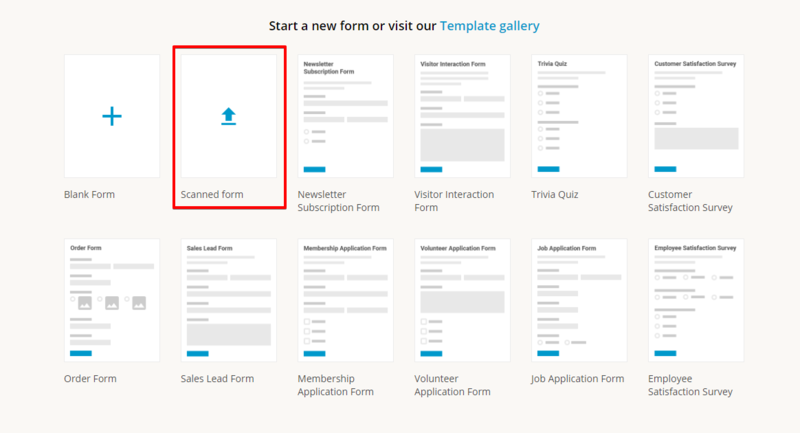 And we’re excited to announce the release of a new form feature – the Scan to Form. Using machine learning, this tool minimizes the burden of translating paper forms – and even handwriting! – to fillable online forms. More than before, this fresh-from-the-oven document digitization tool will allow you to go paperless in no time. When should you use Scan to Form? Let’s say that you couldn’t find a certain form model in our template gallery. Or that you already have a paper form that needs to be digitized. If your daily activity revolves around a lot of paper or PDF forms, then it’s probably a good idea to start converting them to web forms. As a plus, electronic forms are easier to share with teams and integrate with other business platforms and databases. For instance, if you own a real estate business, you could stop wasting time on paper-based processes. Similarly, if you manage transportation & logistics departments, supply chain visibility would greatly benefit from digital tracking of all operations, from start to finish, thus speeding up data collection and analysis. The same goes for those who work in a bank, a financial audit company or a governmental agency. With cloud storage safeguarding, you can relax knowing your sensitive data is secure. Manufacturing processes could also be improved with a more effective workflow integration that doesn’t rely on human error. Automate routing to instantly share service reports, quality assurance documents and to identify production obstacles in real-time. For a step-by-step guide to importing and converting scanned forms, visit the documentation section. In brief, with this new tool conversion from paper documents to electronic forms becomes easier and eliminates the need to build a web form from scratch. Hi I am a private practioner in behavioral health. Paperwork is a must. I have already utilized and embedded a 123FormBuilder feature for my consent forms, but this will be an upgrade. So once I have followed these instructions, am I able embed this form on the back end of my website; replacing the original form? Can I add a scanned form to an existing form I have already created ? So I do not have to create the whole form again? Unfortunately, it is not possible. If we can help you with more details about form building, please write us an email at support@123formbuilder.com.